Can Making & Can Reforming machines for Round and Non-Round Tin Cans. Used for Re-Forming Flattened Round Cans. Reforming is done between One Rubber and One Metal Roller. Reformed Can is without visible marks. Simultaneously Flanges both ends of Round Cans. Semi-Automatic press type operation through key-clutch-cam. Consistent and even flanging ensures proper seaming. Heavy-Duty body made from close-grain cast iron. CNC Machined, Hardened and Ground flanging dies for high accuracy and consistency. Used for Beading / Grooving / Corrugating Round Tin Cans. Increases Rigidity and Stackability of Cans. CNC Machined Beading Rollers for high accuracy. Suitable for rolling Tin Sheet into round form. Rollers are Hardened, Ground & fitted with Needle Bearings. Supplied complete with Electric Motor, Starter, V-belt & Guards. Used for Folding and Locking the Side Seam of Round or Irregular shaped cans. 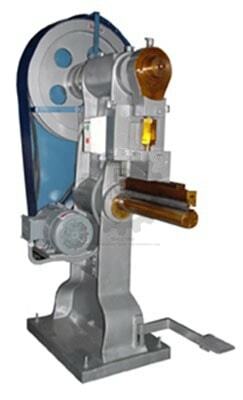 Power Press type Double Operation. 1 for Folding and 1 for Locking. Tools made from special Die Steels, hardened and ground for absolute precision.